Benjamin Bridge is located in the heart of the Gaspereau Valley on the Bay of Fundy, where the cool climate bears an uncanny affinity with the Champagne region of France. The estate makes a range of wines; sparkling, white, red, rose, dry and sweet. Though the focus is on making world-class Méthode Classique sparkling wines that have been compared in tastings to Champagne. The hand crafted wines of Benjamin Bridge have helped raise the profile of the Nova Scotian wine industry. Benjamin Bridge’s Nova 7 has become a Nova Scotian wine icon in just a short amount of time. It showcases the crispness, beautiful aromatics and signature acidity that are quickly becoming the defining characteristics of outstanding Nova Scotian wine. Produced in the European spirit of lightly sparkling, off-dry wines. It is a versatile wine that can be enjoyed as an aperitif, at brunch, with friends on a sunny patio or paired with lightly spicy cuisine, fresh fruits or cheeses. Though Nova 7 maintains a signature style year after year, it is a vintage wine that reflects its growing season. The grapes for the 2016 Nova 7 marks the wine’s 10 year anniversary of its commercial release. 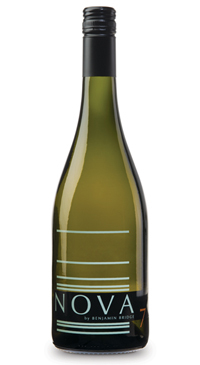 The wine is crafted from aromatic grapes that grow along the Bay of Fundy. This year’s vintage is embraces even more natural and artisinal elements in that the wine is fermented with wild yeasts that are indigenous to the vineyard and the wine’s sweetness is directly related to natural grape sugars. The result is a wine with a light rose colour, delicate aromas of ripe peaches, jasmine, lychee. The palate is energetic and fresh with a light petillance and lots of fruit flavours ranging from sour cherry to ripe mango. The finish is clean with a hint of minerality.